As we age, our eyes require more light and less glare in order to see properly. First, the amount of light required to sustain visual performance increases with age. Research shows that a 60-year-old needs twice as much light as a 30-year-old. 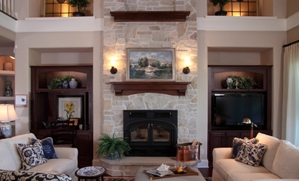 Use dimmers to allow for additional light when needed. Add one or two portable fixtures in areas lacking sufficient light. Second, with time, human eyes become more sensitive to glare. This can seem like a bit of a Catch-22, as more light can often result in increased glare. Try to create more reflected light than direct light. A simple adjustment to window or lamp shades may do the trick. A Hortons Home trained lighting expert can help you select the best lighting products for your family. Turn on one or two table lamps while watching TV to reduce the contrast between the bright screen and the surrounding darkness. Use a torchiere for uplighting as well as downward illumination for versatility. Look for a fixture with a separate task light attached or one with a glass bowl at the top to shine some light downward. Add a task light that can be directed or pivoted as needed. Should bathroom vanity lighting covers turn up or down for the best light? According to the ALA, a good height for a vanity fixture is 60 inches from the floor to the center of the fixture. That recommendation is designed to provide good lighting for a large range of heights. The most important consideration is that the light does not create glare in the eyes of a person standing at the mirror. For example, for a person that is 6 feet tall, a light placed at a level of 60 inches from the floor to the center of the fixture places the top of most fixtures just above eye level. This placement will prevent glare, if the shade is directed upward.